The internet is currently arguing about an image going around, about whether a girl was right or not for declining to help her boyfriend’s mom in the kitchen. The image going around is of a Nigerian show, and in the show a woman meets the boyfriend’s mom for the first time. The mom asks her to help in the kitchen and the woman politely declines, saying she’s a guess in the house. 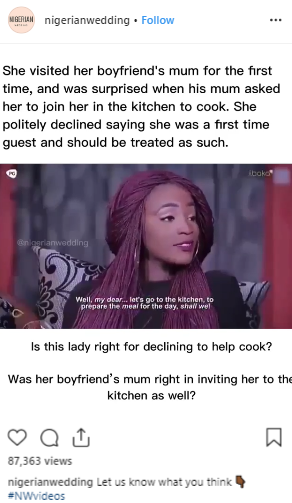 The image is currently going viral, and lot of people are arguing that the girl is absolutely right, and that you shouldn’t be asking someone else to help you cook in the kitchen. Some are also arguing that just because she’s a girl, she asked to help her cook, but wouldn’t have asked if it was a guy. Others are saying the girl lacks basic manners and shouldn’t have declined, and it’s just a way for the mom to bond and ask questions and find out more about her. Some are saying it’s the same situation where a dad would ask his boyfriend’s daughter to come and help him out on the grill while at a Barbecue, saying that the girl would be offended and embarrassed if the boyfriend directly said no to the dad. A Mayor in Georgia will have the town Round Up All Sexual Offenders & Predators & Keep them Locked up in City Hall on Halloween Day.